Safety is of paramount concern to EPG Gas. Our commitment to pursue the goal of causing no harm to people and to protect the South African environment is reflected in the Health & Safety Environment Policy. In this site, we've provided some general safety information based on the properties & hazards of LPG. We've also included details of the Material Safety Data Sheets, which can be printed out for future reference. LPG vapour is heavier than air. Any leakage will sink to the ground and accumulate in low-lying areas. Do not store highly combustible material, ignition sources and hot surfaces at ground level or lower than the LPG vessel or anywhere adjacent to the vessel. LPG vapourises and cools rapidly. It can therefore inflict severe cold burns if spilt on the skin or if some types of LPG equipment are touched without protective gloves and goggles being worn. LPG is non-toxic. It has, however, an anaesthetic effect when mixed with air in high concentrations. The greater the concentration (as available oxygen declines), the greater the risk of suffocation. LPG is odourless. A stench agent is added to allow for detection of LPG leaks. NEVER try to detect leaks with a naked flame or other kinds of ignitions! LPG is flammable like all petroleum fuels. It must be stored away from sources of ignition and in a well-ventilated area. LPG expands rapidly when the temperature rises. Storage tanks, pipelines and equipment must be protected against the high pressure resulting from liquid expansion with rising temperatures. LPG will cause natural rubber and some plastics to deteriorate. Only use hoses and other equipment specifically designed for LPG. Store cylinders in a well ventilated place, away from open flames, electrical appliances and power points. Do not store in a cellar or in a closed area. The gas is heavier than air and will "flow" into low points and collect, causing a flammable mixture. Never store the cylinders near to a heat source or in direct sunlight. Always use a hose designed for use with LPG. The hose should have a maximum length of 2m with clamps at both ends. Hoses should be replaced every 2 years as they deteriorate over time. When in use, all cylinders must be equipped with pressure regulators designed specifically for either propane or butane, which will regulate the pressure when temperatures change. Use the correct regulator for the type of gas. Always follow the instructions supplied when connecting the pressure regulator to the cylinder and do not open the cylinder valve or regulator tap until the pressure regulator is securely attached. Never smoke while connecting the equipment and do not check for leaks with a flame. Look at the washer of the pressure regulator or valve before connecting each new cylinder. If the rubber looks worn or damaged, replace it or contact EPG Gas. Make sure the cylinder is upright. Place the gas cooker and cylinder above ground level with the cooker positioned higher than the cylinder. Ensure that the rubber hose does not touch the surface of cooker. When cooking, keep doors and windows open. Do not rest hot cooking appliances on the cylinder. Never subject the cylinder to excessive heat. Turn off the valve or regulator tap when you have finished cooking. If you will not be cooking for a long period, remove the regulator and seal the valve nozzle with the red safety cap provided. Do not let children handle the cylinders or appliances. Regularly check your hose for signs of damage or cracking. Check the hose connection for leakages by applying a soap solution. DO NOT test with naked flame. Replace the hose and clips every 2 years with approved types, which can be obtained through from EPG Gas. Replace regulators every 5 years with approved types, which can be obtained through from EPG Gas. Turn off the taps of the connected appliance, then close the cylinder valve or regulator tap. 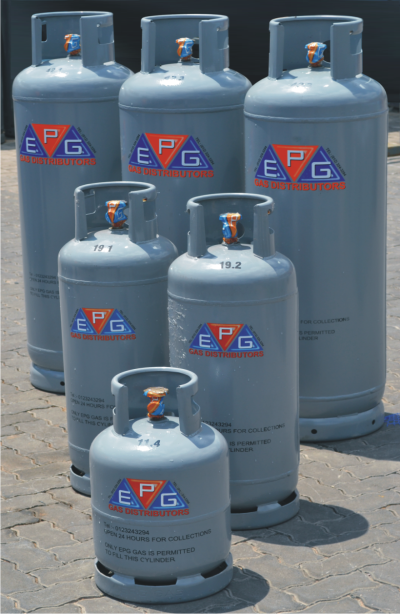 Always return your empty cylinders to EPG Gas. Turn off the valve of the tank or cylinder. Extinguish all naked flames immediately. Do not operate any electrical equipment and be aware of any equipment, which may switch on or off automatically. Open all doors and windows to ventilate the area. Contact your installer or the technician who maintains your appliances. If the leak is on a cylinder, move the cylinder to a well-ventilated outdoor area. Turn off the gas at the main shut off valve of the cylinder. Restrict unauthorized access to the area. If the leak is on a cylinder, move the cylinder to a well ventilated outdoor area. Call the fire brigade, advising them it is a leak/fire involving LPG. For a leak or a fire indoors, get everyone out of the premises. For a leak or a fire outdoors, evacuate all persons from the area and keep upwind of any leak. When the fire brigade arrives, indicate to them all areas where LPG is stored (cylinders). The safety of our customers, our neighbors, our contractors and our staff is of paramount concern to EPG Gas. Equal concern is given to health and environmental issues associated with our business and this is reflected in our Health, Safety and Environmental Policy. Our business also follows the Health, Safety and Environmental Management System (HSE-MS), which is similar in concept to an ISO 9000 quality system. This ensures that the Health, Safety and Environmental risks associated with our business activities are as low as reasonably practical. What does this mean in practice? Here are some examples: The equipment that we use in our business is designed, operated and maintained to high standards. Every time a cylinder enters our filling plant, it is checked for damage and corrosion. It will only be filled if it passes this inspection. After filling, every cylinder is checked to make sure that there are no leaks and to make sure that it has not been over-filled or under-filled. Only cylinders that pass these checks will leave the filling plant. Every cylinder is pressure tested periodically to ensure that it is fit to be used. Drivers of vehicles transporting LPG are trained in good driving practices, emergency procedures, etc.